The Combi Compact HRE 36/40 from Intergas is a highly reliable boiler which has been made and manufactured by Intergas. 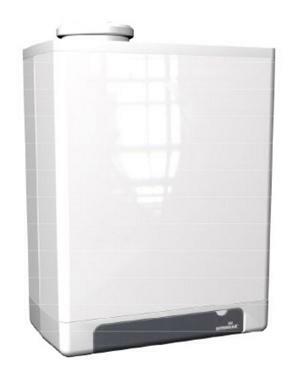 This condensing, wall mounted unit will supply both your hot water and heating on demand by using the mains water supply. This means you don't need to have bulky tanks or cylinders making it an ideal choice perfect for smaller homes where space may be limited. This boiler has been designed with revolutionary technology and delivers one of the highest energy efficiency levels available. It is B rated with a 88.8% efficiency level which will not only save you energy but should also help to lower your energy bills. This boiler has an output rating of 41kW making it perfect if you have a larger property with multiple bathrooms and a high demand for hot water. This unit doesn’t have a diverter valve or valve motor, hot water plate heat exchanger or air pressure switch. This has been done to reduce the number of parts which could potentially develop issues. This should improve the reliability of your boiler. The unit has almost no standby losses and includes the option of either a horizontal or vertical flue. This highly reliable boiler has been recommended by the Energy Saving Trust and includes a 10 year warranty on the heat exchanger with a 7 year warranty on parts.